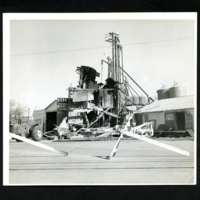 1969 - Remains of Hesston Mill after the 1969 fire. Mill was located north of Mopac (?) railroad on east side of street -- 200 block N. Main, Hesston, KS. -- handwritten on back of photograph. 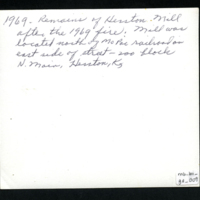 unknown, “Hesston Mill fire remains,” Hesston Public Library, accessed April 25, 2019, https://hesston.digitalsckls.info/item/1419.